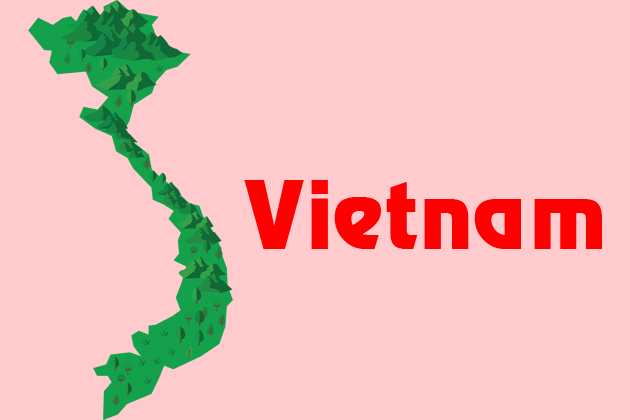 Vietnam is considered as one of the most culturally diverse countries in Southeast Asia. The cuisine is an aspect of culture and in Vietnam, thus, Vietnamese street food is also variable throughout the country. 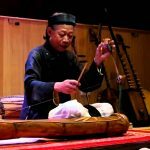 If you are planning to visit Vietnam and do not know what and where to eat unique street foods? 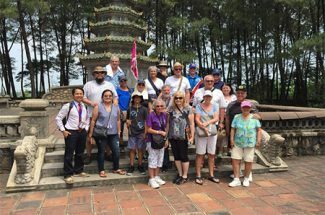 Indochina Tours recommend you a list of must-try Vietnamese street foods from north to south of this S-shaped land. 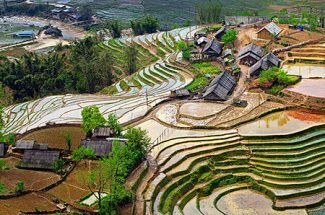 Mother nature gave Northern Vietnam magnificent mountains, picturesque valleys, shining golden rice terraces, curvy rivers, and roads. With 4 seasons in a year, the food varies and changes seasonally. Due to the cold weather feature, Northern cuisines taste more savory than Central and Southern. 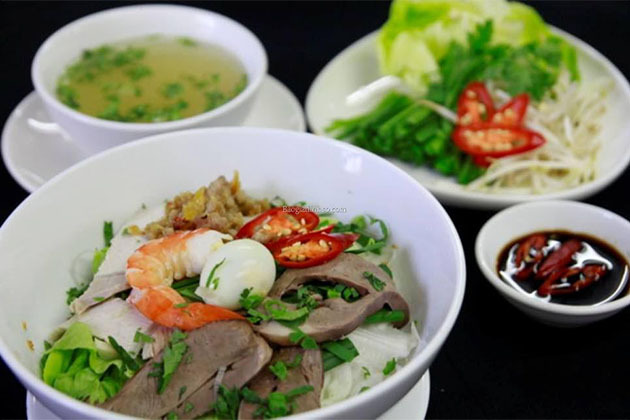 Among various kinds of street foods in Vietnam, “Pho” is the most famous dish which is reviewed by foreign travelers as an excellent representative of Vietnamese cuisine, A traditional Pho appeared in Northern Vietnam in the early 1990s, then it gradually becomes the favorite dish of Vietnamese people. 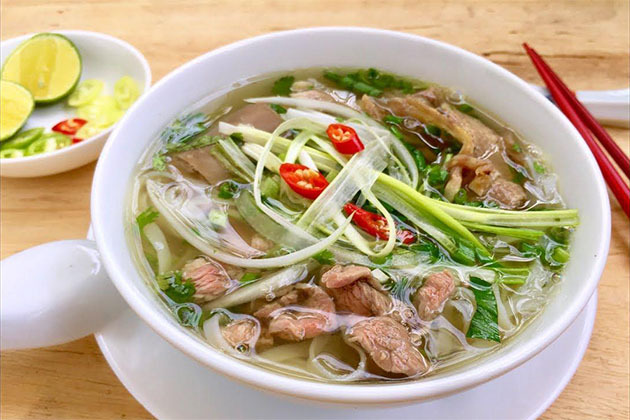 Primarily, Northern “Pho” has an intense and delicate flavor due to its clear and simple broth. The beef bone, anise, cloves, and cinnamon are harmonized into one subtle flavor. Besides, tourists can taste “Pho Tai” which “Pho” is served with thinly sliced rare beef cooked quickly in the hot broth. Condiments such as green onions, thinly sliced white onion, chopped cilantro or mint are put on top of the bowl. 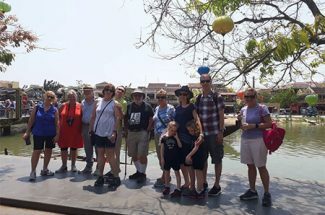 Stroll around Hanoi streets, you can find a specific smell that encourages you to have a bowl of Pho with no hesitation. If Pho is common street food that visitors can easily find throughout the country, Bun Cha is likely more popular in North Vietnam, especially in the capital Hanoi. 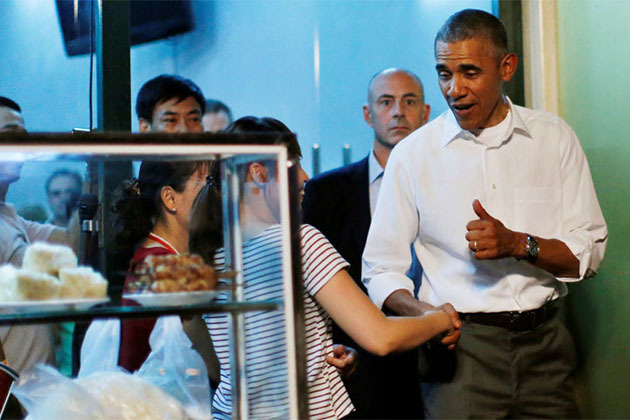 On a visit to Hanoi, President Obama has tasted and absolutely loved it a lot. Bun Cha is usually served at some street-side restaurants, so you will find yourself like a local when sitting down to a plastic chair and seeing slices of marinated pork grilled on an open charcoal grill. After being grilled, you can try a morsel with rice noodle, savory and dipping sauce. It also can be used with fried meat rolls or fried crab spring rolls. 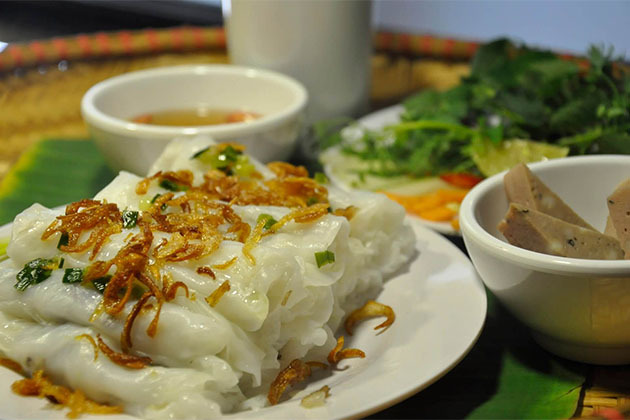 Banh Cuon is a representative of Northern cuisine. Different provinces have their own methods to make Banh Cuon, thus the taste is not similar. 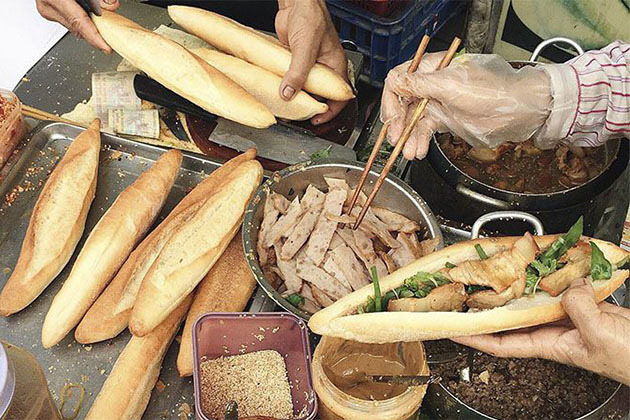 People say that the recipe of Banh Cuon in Hanoi is the standard one which is the combination of marinated ground meat, onions, minced wood ear mushroom wrapping in a steamed rice flour sheet. Tourists should taste Banh Cuon with the dipping sauce which is nearly similar to the sauce for Bun Cha. Another rolling street food in Northern Vietnam, Bo Bia gives you a refreshing taste with fresh coconut and sugar bar, adding a bit of greasy and aromatic feeling from sesame seeds. The food tastes it best when you enjoy the flavors of all ingredients at the same time. Sometimes referred to as ‘Hanoi tiramisu’, this isn’t a coffee as usual. 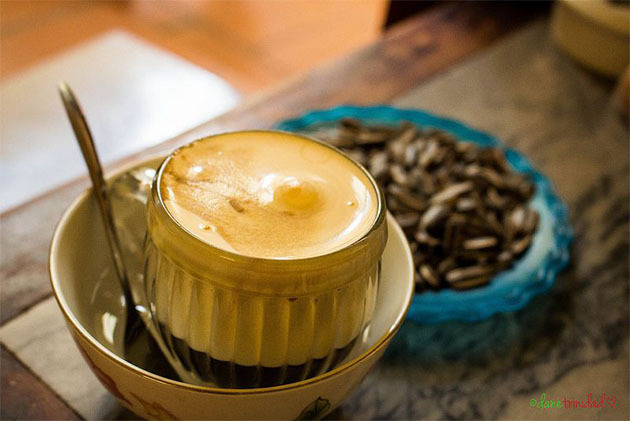 In the past, Vietnamese people blended the egg yolk strongly to mix it with coffee due to the lack of condensed milk. It now becomes a popular drink in Hanoi in winter. Find a coffee shop in the Old Quarter, take a cup of egg coffee, then mix these ingredients up or scoop it up, have it hot or iced, either way, it’s decadent and very addictive. 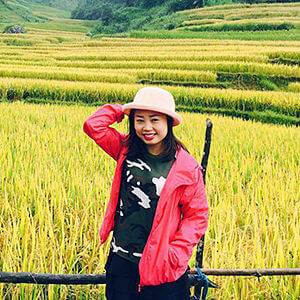 If visiting Hanoi in autumn, your North Vietnam tour will be more interesting as you have a chance to try one more significant food – Com. 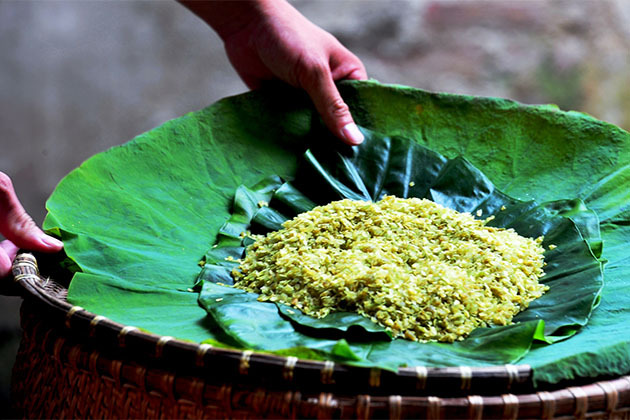 Com is made of green sticky rice ripened by roasting and screening to separate the husk from the rice inside. Then it is wrapped in lotus leaves in order to keep its freshness and natural smell of the field. Com is also special by the way tasting it. It is best tasted when you enjoy it slowly by picking just a small amount once by your fingers. Don’t forget to note Com into your Vietnamese street foods list when coming to Hanoi. 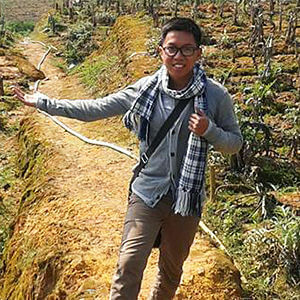 The narrow land of Vietnam brings a spicy taste of cuisine. Central people eat spicier than people in the north and the south. Thet had “chili things” in every single dishes, which can be fresh chili slices, chili powder, chili sauce or salted or fermented chili. Bun Bo Hue is a popular street food of Central Vietnam, has a spicy broth and noodles shaped like vermicelli. The traditional Bun Bo Hue recipe features beef shank and gelatinous pig blood. 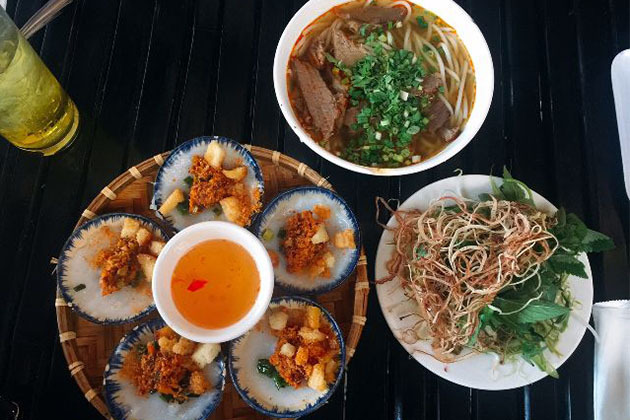 The strong and distinguishable taste of Bun Bo Hue among several types of noodle in Vietnam will provide a satisfying meal for tourists. Roll a full chopstick of noodle, pick a beef slice then finish with a spoon of soup, enjoy! The noodle has yellow and white color and made from rice flour. It is mixed with shrimp, pork, vegetables and topped with grilled rice paper and spices. The mystery of Mi Quang is in the sauce which is slightly sweet. 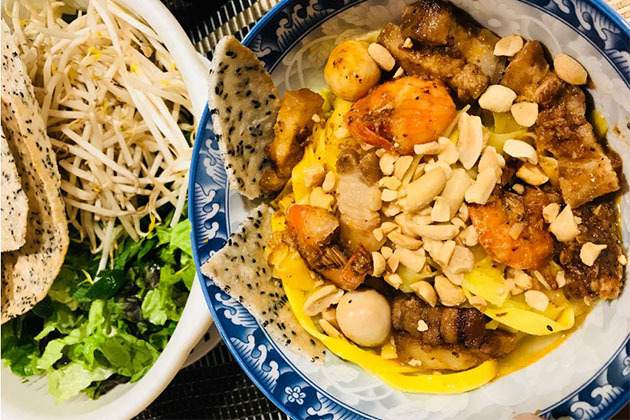 Enjoy a bowl of Mi Quang, you can feel the crispy sound from the grilled rice paper, a spicy and sweet taste from the soup and the smooth swallow of the noodle. 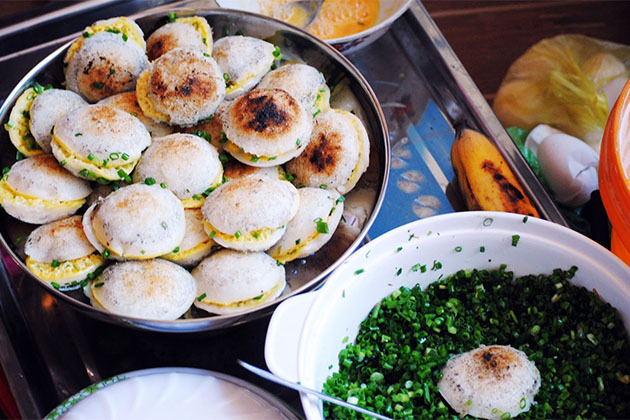 Banh Can is a popular snack in Coastal Central of Vietnam. 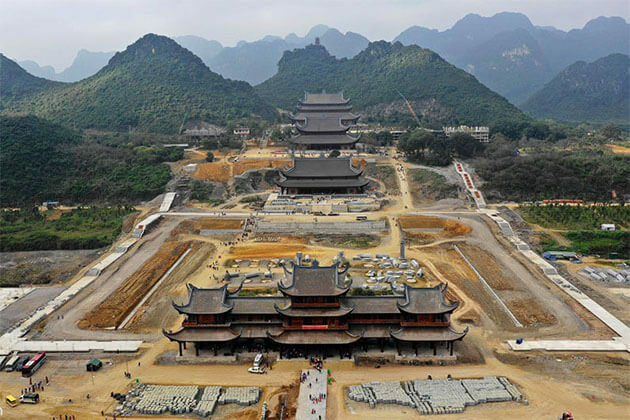 You can find it in anywhere in Khanh Hoa, Ninh Thuan, Binh Thuan Province. 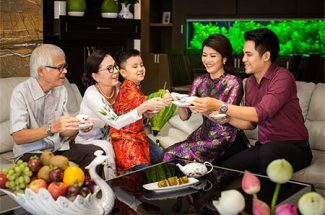 Enjoy Banh Can in the morning is the best feeling when the cool water blends perfectly with the warmth of the cake as well as the slight aroma of rice powder. The street food is even better when it is eaten with fried onion. 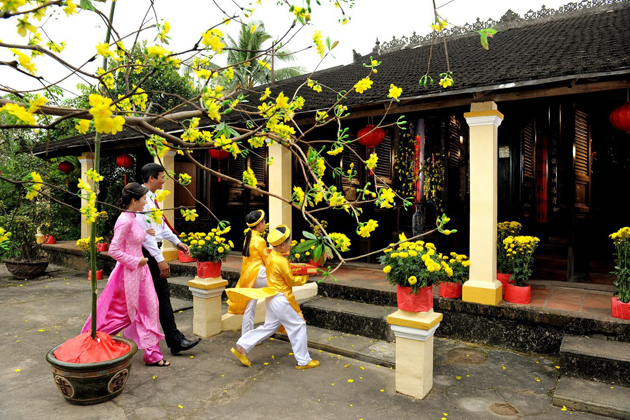 If you love sweet things, come to the south of Vietnam. They are sweet both in their personalities and even in their cuisine. 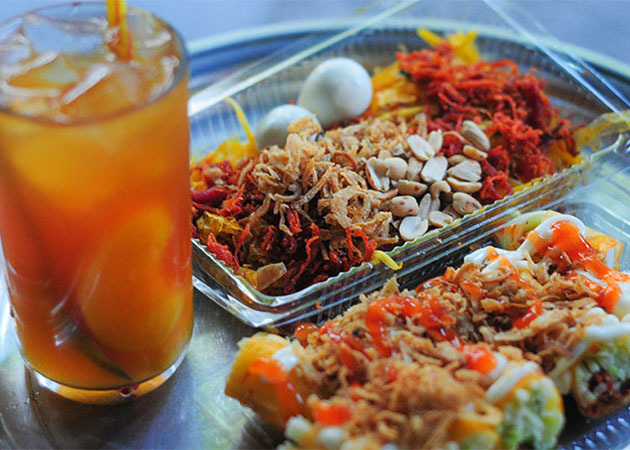 Throughout decades with ups and downs, Hu Tieu has still been a cheap and popular street food among the blue-collar society and now presented as an interesting culture instinct of Ho Chi Minh City and other Southern regions at night. Mentioning about Hu Tieu, people will imagine a scene of Ho Chi Minh City at night with narrow streets, an instant shop is set up simply with a boiling soup pot and several small trays of ingredients. That image draws the notice of people in every corner of Ho Chi Minh City at late night. 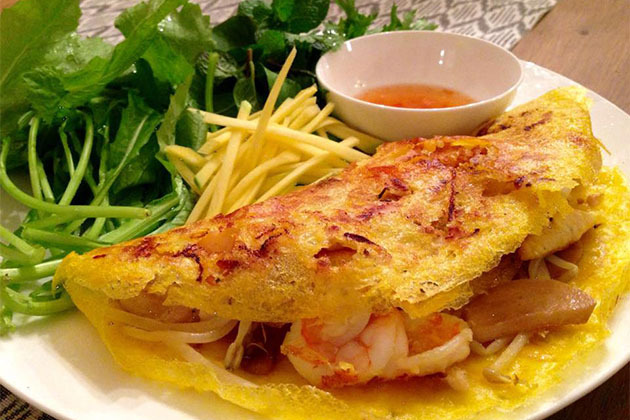 Banh Xeo – also known as crispy Vietnamese pancake, crepe or sizzling cake – is a famous street food which is widely believed to originate from France during its occupation of Vietnam. Vietnamese people use the word “Xeo” to depict the sizzling sound when pouring the rice batter into the hot skillet. Banh Xeo is made from rice flour, bean sprouts, pork, and shrimp, then rolled with rice paper, lettuce and cucumber. When dipped with the accompanying peanut sauce, it is more delicious. The soft and stretch of sliced rice paper, the sour of mango slices, the spice and smell of dried beef with an aroma of Vietnamese coriander, all are mixed together and makes Banh Trang Tron the most delicious street snack of Southern Vietnam. 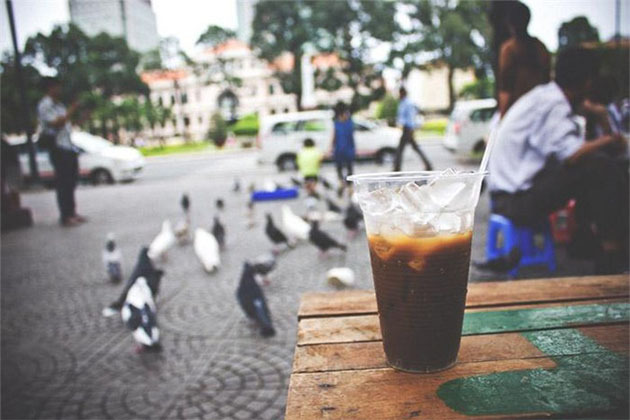 The famous and classic drink has long been part of the daily routine of the people of Ho Chi Minh City. College undergrads, office workers, blue-collar employees and young people in this vibrant city love kicking off their day with a glass of milky iced coffee. The best place for this delicious Vietnamese street food is not a luxury restaurant but a street-side coffee corner with low tables and tiny plastic of folding wooden stools. Warm air and the echoing noise of traffic intensify the taste, enjoy the aromatic flavor of milk and coffee and observe the daily life of local people. No Vietnamese street food can be completed without the name of Banh Mi. It is served as any meals during the day. Banh Mi can be made in various ways ranging from sour, spicy, salty and sweet in terms of flavors depending on the customer’s needs. Some common and traditional Banh Mi are pates, fried egg, pork floss, pork roll, etc. In between these layers are fresh herbs, shredded pickled carrots and green papaya, cucumber slices and a touch of gravy or soy sauce. Stretching from North to South, Banh Mi diversifies regionally. 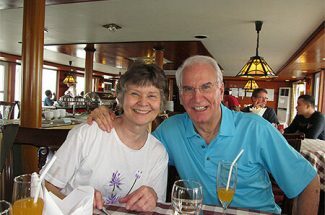 It can be packed with Siu Mai in Dalat, grilled chopped fish in Nha Trang or fries in Hanoi, etc. With its reputation, Banh Mi is considered to be the essence of Vietnamese cuisine. It is must-try street food in Vietnam that even the pickiest eater can’t resist.